This make-ahead omelet bake is a surefire crowd-pleaser. Start with bread, then layers of ham, broccoli, cheese and onions. In other words, the works! Spray 13x9-inch baking dish with cooking spray; cover bottom with 6 bread slices. Top with layers of half each of the ham, broccoli, onions and Singles pieces. Cover with remaining bread slices. Repeat layers of ham, broccoli and onions. Beat eggs and pepper in medium bowl with whisk until blended. Gradually beat in milk; pour over ingredients in baking dish. Cover. Refrigerate 3 hours. Heat oven to 350°F. Bake, uncovered, 45 min. Top with remaining Singles pieces; bake 15 min. or until knife inserted in center comes out clean. Let stand 10 min. before cutting to serve. 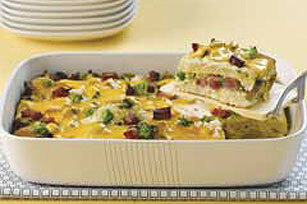 This delicious casserole can be refrigerated up to 12 hours before baking. Be sure to bake it uncovered as directed. Prepare using firm whole wheat or multi-grain bread. Prepare using your favorite variety of OSCAR MAYER Ham.